The Ica stones of Peru show illustrations of advanced surgery (like heart and brain transplant, Caesarean section) and men riding dinosaurs: Dr. Javier Cabrera discovers about 40,000 stone tablets detailing advanced science in the Peruvian desert of Ocucaje. 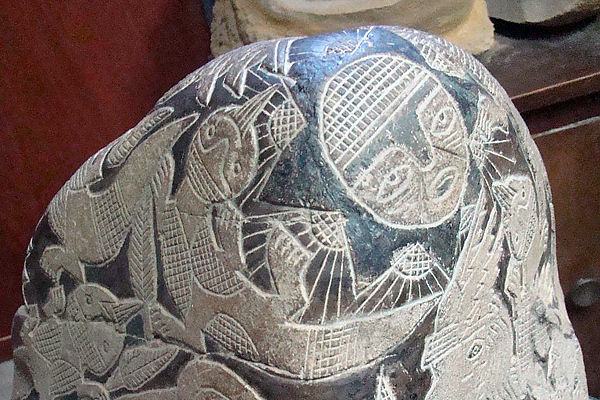 These were called the Ica Stones of Peru. 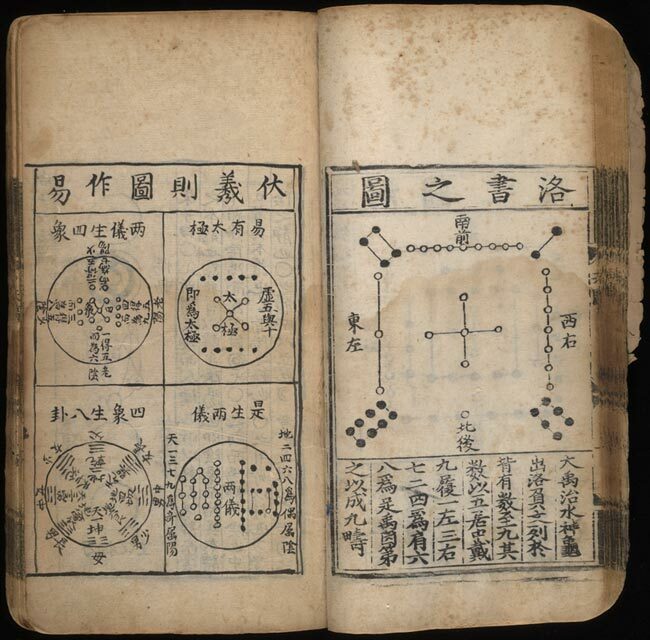 The tablets detail such complex ideas as astronomy, surgery (heart and kidney transplants), C section, acupuncture, genetic disorders, and more. There were descriptions of vehicles which flew through spaces without consuming fuel, descriptions of the lines drawn at Nazca. They described the evacuation of large-headed small-statured race to a planet which would now be in the Pleaides star cluster. These were found in the Peruvian state of Ica. The city of Ica is only 100 miles from the city of Nazca. According to the apocryphal "Book of Enoch", the Nephilim "descended on" Mount Hermon. "Eve", one single, hypothetic woman might be the sole source of the whole of mankind (homo sapiens) according to recent, genetic research. This theory is supported by a number of additional evidences. First Illuminatus, Gruad, rules in Atlantis. Tiahuanaco, the height of the Lemurian remnant, begins construction. Indian country of Rama existed. Remains of their large cities still exist in the deserts of India and Pakistan (Mohenjodaro). Indian texts from this period tell of anti-gravity space ships called Vimanas, or Astras, and a war with the Atlanteans on the moon. Curiously, Soviet scientists have discovered what they call "age-old instruments used in navigating cosmic vehicles" in caves in Turkestan and the Gobi Desert. The "devices" are hemispherical objects of glass or porcelain, ending in a cone with a drop of mercury inside. Some ancient Indian texts describe a war with Atlantis (who flew Vailixi machines) using flying machines and atomic bombs. A great flood engulfed the Earth according to Mexica--Nahuatl mythology and timetable. The flood, caused by the slippage of the Antarctic ice sheet into the sea. This was in its turn a consequence of the 12th planet, called Marduk by the Babylonians. 11,000-13,000 BC, Moon came into orbit around Earth. The piece of rock blasted off the surface of Mars carrying signs of biological life that came to be called ALH84001, crashed in Antarctica. Estimated date of inscriptions on stone disks by the Dropa tribe, small-bodied, yellow-faced aliens who crash land on Tibet/China border. Remains discovered in 1938. Aligned graves contained skeletons of short, spindly people with large heads. A stone disk with tiny pictograms on it told the story of aliens crash landing in the mountains of Bayan Kara-Ula on the China Tibet border. They tried to make friends with the neighboring Ham tribe, but the Hams hunted them down and killed them. An English scientist later visited the area and learned their lore. Descendants of the Dropas still live in the area, and they don't look Mongolian or Chinese. The Dropas came from a star in the Sirius system. The small people of the Dropas were rediscovered in the same mountains in 1995. Earliest estimated date of carving of the Crystal Skull found at Lubaantun in the Yucatan. Plato said the Atlanteans invaded Athens this year and a great war was fought. More evidence exists the Sphinx was built at this time, before the Egyptians. The Mullion culture suddenly appeared approximately 10,000 years ago along the Algerian coast with the largest skeletal population in the entire prehistoric record. In addition, the Mullions also possessed the largest cranial capacity of any population the world has ever known--approximately 2,000 cc versus our present 1,400 cc. 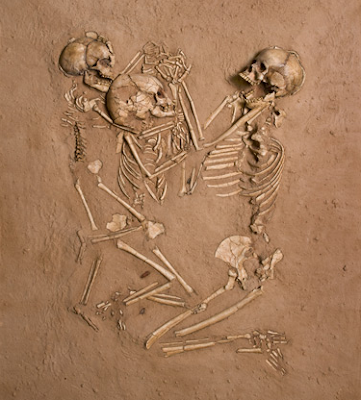 Skeletons found showed they were mostly women and children, who worked with tools never before seen and with unknown domesticated animals. Ubaid period predates Sumeria, supposedly the first civilization. 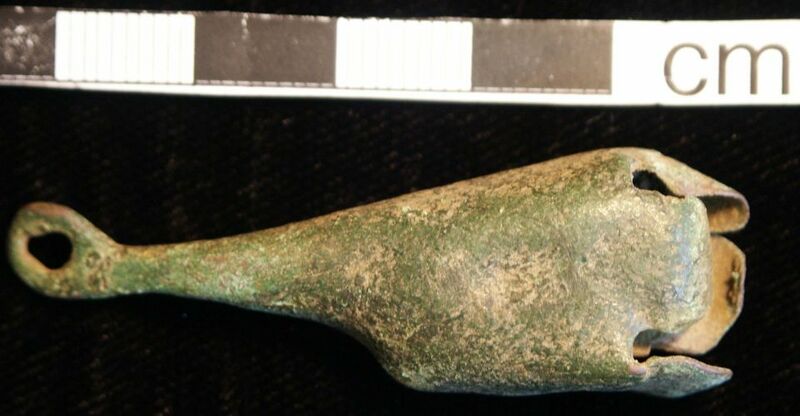 At the Al Ubaid site in Iraq, a mask was found which looks like it has a high, long forehead. Australian Aboriginal mythology tells of foreign visitors, there are paintings on caves that describe just that..Visitors from outer space. A great meteorite hit the Atlantic ocean off the coast of Portugal. The event is mentioned in Assyrian and Babylonian scripts. A great change took place in Egypt. Well-organized monarchies, the art of writing, monumental architecture were all achieved within a short period of time from little or no background. Mayan year 0, or the beginning of the current Great Cycle according to the Mayan Tzolkin Calendar, which is supposed to end 2012 CE. Trephination (cutting a hole in the skull) practiced by people all over the world. Some Sumerian statuettes are reptilian and Dr. Arthur Horn says the Sumerians interacted with the Annunaki, who were reptilian. A third millennium Assyrian clay tablet says "the world is speedily coming to an end". The Eleusinian Mysteries traced back to this time ("the time of Inachus"). Enuma Elish--The Babylonian Epic of Creation. Early references to Mithraism on cuneiform astronomical tests. In Egypt, the Pharaoh Thutmose III sees silent, foul-smelling circles of fire and flying discs in the sky. Cosmas and Damian, two brothers, accomplished successful leg transplants 1700 years ago. Had they somehow acquired knowledge of the techniques of gifted surgeons from the dim past? Approximate date of the destruction of Thera, on which Atlantis legends are probably based, caused huge destruction to Cretan civilization. Approximate date "I Ching" written in China, attributed to Wen Wang. Legendary Thule civilization in the Gobi region destroyed by a catastrophe, "possibly of an atomic nature". 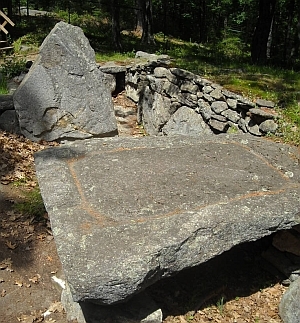 Huge Sacrificial Table built at Mystery Hill near North Salem, New Hampshire. Approximate date of building of Solomon's Temple in Jerusalem, traditional origin of the Masonic fraternity; alleged assassination of Temple master-mason Hiram for refusing to reveal Masonic secrets. Approximate time settlers from Europe and the Middle East established colonies in North America. The first known account of the Poltergeist phenomena. 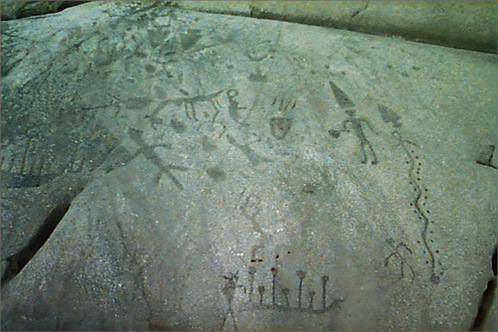 D. Kelley, a Calgary archeologist, claims that rock carvings in Petroglyph Provincial Park were etched by European explorers circa 800 BC, rather than by Native Americans. One petroglyph, for example, depicts a Viking-like ship almost identical to those carved on a rock near Boslund, Sweden. There are also abstract symbols like those used by Northern Europeans in the same time frame. Peru Aerial landing strips are built in the Peruvian Andes. Mithra born of a virgin in a stable on December 25th, according to the legend. His resurrection was celebrated at Easter. Time of Buddha, Lao Tse, Confucius, Zarathustra, Orpheus, Pythagoras, Zachariah and Daniel--an Illuminated century. Life of Gautama Siddhartha Buddha. Approximate date Plato's The Republic written, featuring such Illuminoid images as the Philosopher Kings, the Divided Line and the parable of the Cave. The story of Atlantis first recorded by Plato in his Dialogues (specifically in Timaeus and Critias). Plato said the story of Atlantis was told to Solon by a learned priest of Egypt. Life of Greek anarchist Zeno, founder of Stoic philosophy. 329 BC Alexander the Great, via his historians: "...told of 2 strange objects in the sky that dived repeatedly at his army as they were attempting a river crossing. (Jaxartes River). The action so panicked his elephants, horses, and men they had to abandon the river crossing until the following day. They were described as great silver shields, spitting fire around the rims." Invention of Mayan calendar in Yucatan, based on advanced astronomy. The Mahabharata and Ramayana (Sanskrit). Primitive battery created in Iraq. Later to be found in 1938 by Dr. Wilhelm Konig in the basement of a Baghdad museum. Rule of Asoka, king of India who allegedly founded the Nine Unknown. From Medieval reporter Conrad Wolfhart, at Lanupium, a remarkable spectacle of a fleet of ships was seen in the air. Rome, from Prodigia of Julius Obsequens: When C. Murius and L. Valerius were consuls in Tarquinia towards sunset, a round object, like a globe, a round or circular shield, took its path in the sky from west to east. Rome, from Prodigia of Julius Obsequens: At Aernarie, while Livius Troso was promulgating the laws at the beginning of the Italian war, at sunrise, there came a terrific noise in the sky, and a globe of fire appeared burning in the north. In the territory of Spoletum, a globe of fire, of golden color, fell to the earth gyrating. It then seemed to increase in size, rose from the earth and ascended into the sky, where it obscured the sun with its brilliance. It revolved toward the eastern quadrant of the sky. Rome, from Pliny, Natural History: Book II, chapter 34: "In the consulship of Lucius Valerius and Caius Marius, a burning shield scattering sparks ran across the sky." Pirates based in Cilicia (a province on the southeastern coast of Asia Minor) were practicing "secret rites" of Mithras. 42 BC Rome, from Prodigia of Julius Obsequens: Something like a sort of weapon, or missile, rose with a great noise from the earth and soard into the sky. Birth of Jesus of Nazareth, accompanied by various Illuminoid trappings: three early Men-In-Black disguised as the Wise Men; strange lights in the sky; miracles such as visits from angels, prophecy and suspension of time are reported.